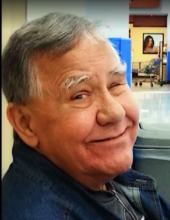 Michael Lynn Eskridge, 69, passed away Monday, November 12, 2018 at Baptist Health Floyd Hospital in New Albany, IN. He was born March 25, 1949 to Galen and Lucille (DuVall) Eskridge. He was a former employee of Edwardsville Water Co. and a member of Taswell Christian Church. He was preceded in death by his parents, sisters, Joyce Taylor and Flora Lee Leffler and a brother, Windell Lynn Eskridge. He is survived by his wife Joyce Gunn-Eskridge, a son, Jason Eskridge of New Albany, IN. a sister, Una Gail Eskridge of Charlestown, IN and four grandchildren, Kristyn Holcomb, Donavon, Patience and Michael Eskridge. Visitation Friday, November 16, 2018 from 4-8 PM at Gehlbach & Royse Funeral Home in Georgetown, Indiana and Saturday, 9-11 AM. Funeral Service will be at 11 AM at the Funeral Home. Interment will be in Edwardsville Cemetery, Edwardsville, Indiana. To send flowers or a remembrance gift to the family of Michael Lynn Eskridge, please visit our Tribute Store. "Email Address" would like to share the life celebration of Michael Lynn Eskridge. Click on the "link" to go to share a favorite memory or leave a condolence message for the family.